HADDONFIELD HORROR: The basic idea for Midnighters came from a horrific true story. What was it about that story that caught your attention because there is A LOT going on in that story? ALSTON RAMSAY: For your readers who don’t know, the story in question is about a nurse who hit a homeless man with her car well north of a decade ago. He went halfway through the windshield, she drove him home, and he proceeded to bleed out over the course of a day or two while begging for help. It’s a grisly, petrifying story. What caught our attention – my brother had read it before as well – was that a seemingly normal person could find themselves in circumstances where they make truly terrible decisions with unfathomable consequences. Call it the horror of real human behavior. It’s the kind of story that sends shivers up your spine. HH: Was the film always a thriller or did turn into that one? AR: We always intended for it to be part-thriller and part-horror – and I think it straddles the line between the two in a way that will please both thriller and horror fans. HH: The story has been turned into another film in 2007 called Stuck, its wildly different to Midnighters. Have you seen it? It is interesting that from the one incident has created two films that vary so much. AR: I did not see Stuck. My understanding is that that film was meant to recreate the actual incident. 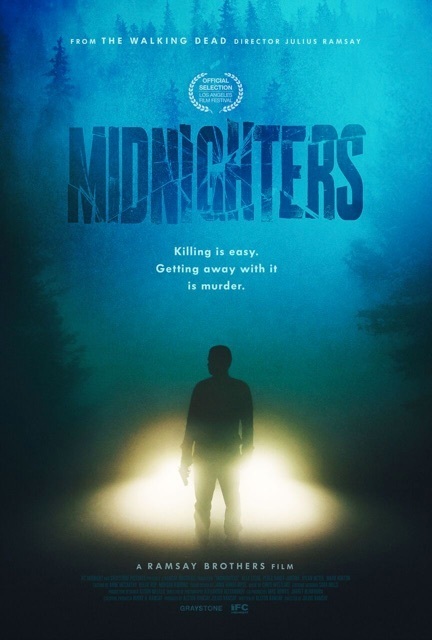 With Midnighters, the real-life event really only provided the initial inspiration – so a spark more than anything else. From that spark, we went in an entirely novel direction to create an original story and characters that are more sympathetic than the couple who partook in the actual incident. HH: Your brother directed the film, was this always the plan or was there a bit of luck or serendipity involved? AR: We always planned to have him direct the film. The whole idea behind the project was for us to come up with a story together that I could write, that he could direct, and that we could produce. HH: You worked as a speechwriter for a lot of top government officials – What was that like and how do you go from speechwriting to a screenplay? AR: Oh boy, there is so much I could say about speechwriting for senior government officials. If I had to sum it up in a work, it’d probably be ‘surreal’. I never imagined I’d work in the Pentagon for a secretary of defense (Robert Gates) – nonetheless hopscotch around the globe with him on a modified 747 double-decker jet called the E4B. Which is more affectionately known as the ‘Doomsday Plane’ since it was originally designed in the Cold War to withstand a nuclear attack and be able to launch the counter-attack. That is to say, it was built quite literally for nuclear Armageddon. Spending a year in Afghanistan working for General David Petraeus at the height of the war there was also surreal. My takeaway from both experiences was really the awe and esteem I had and have for the men and women who volunteer to serve the country in uniform (I was always a civilian). It’s amazing and humbling to be in their presence. In terms of the transition from speechwriting to screenwriting, it’s obviously a very different craft but two aspects of speechwriting have proven to be invaluable. The first is with dialogue: as a speechwriter you focus on the spoken language and learn to write in someone else’s diction – which is the same thing you do with well-written characters and well-written dialogue. The second skill is research. Whether a screenplay or a speech, the foundation of good writing with both is in-depth research of the subject matter. That’s where you find the gems that really make something sing. HH: What is your writing process? AR: For screenplays, I mull things over in my head for some period of time until I know the major plot points and story beats, and have a good sense of the primary characters. Then I outline it with note cards. With all that done, I finally put pen to paper (or fingers to keyboards as is the case these days) and generally pull exceedingly long days for two weeks straight to crank out a first draft. HH: What inspires you to write? Do you have any writers that you look up to? AR: I find inspiration in a lot of places – but usually it’s a story I read (news in particular) that sets off a creative chain reaction where I hone in on a world or a concept that I want to explore, learn more about, and then share with others. From there it’s off to the races. There are many writers I admire – though usually it’s a particular script of one of them I’ve read. Charlie Kaufman and James Cameron are both masters of the craft whose scripts any aspiring screenwriter should read. In terms of writing more generally, the biggest influences on me are probably William Faulkner, Ernest Hemingway, and William F. Buckley (with whom I had the incredible opportunity to work before he passed). The latter two come from the journalism world, which is where I began my career and why they were so influential. HH: Can you tell me what you are working on now? Are you and your brother planning to do a few more films together? AR: Yes, I definitely think Julius and I will team up in the future – but we also have separate projects too where there’s no overlap (like the Nolan brothers). I have several completed scripts, but I’m most excited about a horror/thriller feature that has to do with cryogenics and a dystopian TV series based in modern-day America.